Men Nguyen (right) eliminated Nikolay Evdakov in fourth place, and Brandon Adams (left) eliminated Steve Billirakis in third place, setting the stage for a heads-up battle for the bracelet. Joe Cassidy survives this all in situation at the final table of Event #10 ($10,000 Seven Card Stud), but is eventually eliminated in fifth place, earning $86,461. Eric Mizrachi (left) is on hand to sweat his fraternal twin brother Michael (right) at the final table of Event #10 ($10,000 Seven Card Stud). 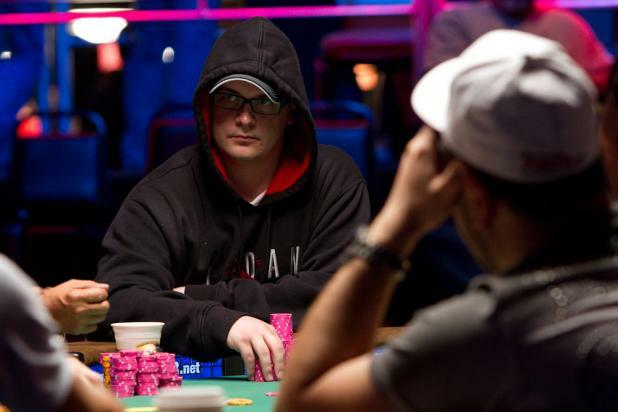 A poker player himself, Eric planned his own WSOP playing schedule around his brother's deep run in this event so he could be on hand to support him. Russian banker Vladimir Schmelev (foreground, left) is all in with a pair of fours (4-4) against Men "The Master" Nguyen (foreground, right), who has a pair of eights (8-8) at the final table of Event #10 ($10,000 Seven Card Stud). Both players went on to make two pair, though Nguyen's aces and eights beat Schmelev's fours and threes to win the pot. Vladimir Schmelev was eliminated from his second final table in a week, finishing in seventh place and earning nearly $56,000. After Men Nguyen folds, Michael "the Grinder" Mizrachi (left) shows a pair of aces against Nikolay Evdakov's pair of jacks. 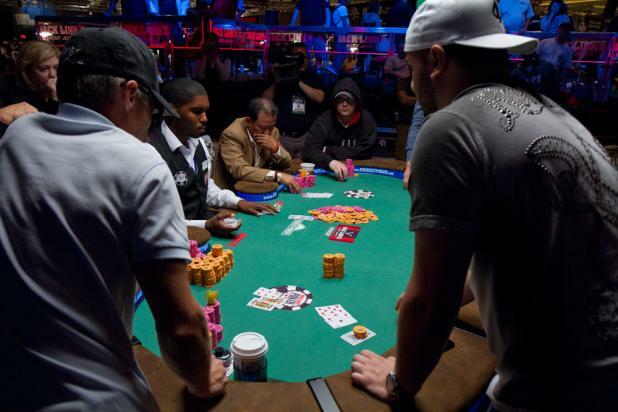 Mizrachi would pick up a pair of queens on sixth street to win the pot and triple up in chips, keeping his hopes alive of winning two WSOP bracelets in a single week. Michael "The Grinder" Mizrachi (right), who won the $50,000 Poker Player's Championship less than a week ago, is short-stacked and nearly all in on fifth street with seven players remaining in Event #10 ($10,000 Seven Card Stud). 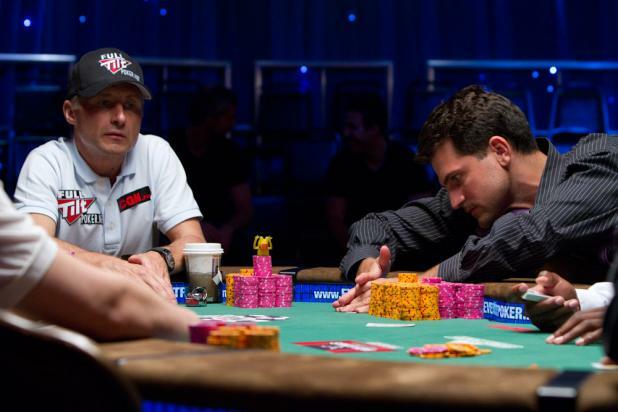 Nikolay Evdakov (left) raised behind, forcing a fold from Men Nguyen (next to the dealer). The raise from Evdakov greatly benefited Mizrachi, because he was getting nearly 2-to-1 on his money and only had to face one opponent. Steve Billirakis (pictured) is the youngest player to ever win a bracelet in the United States -- he won it less than two weeks after his 21st birthday. Billirakis's record finished a string of four straight years where the youngest-bracelet-winner record was broken. In 1989, Phil Hellmuth became the youngest WSOP winner when he won the Main Event at the age of 24. In 1998, that record was broken by Daniel Negreanu, earning him the nickname "Kid Poker." 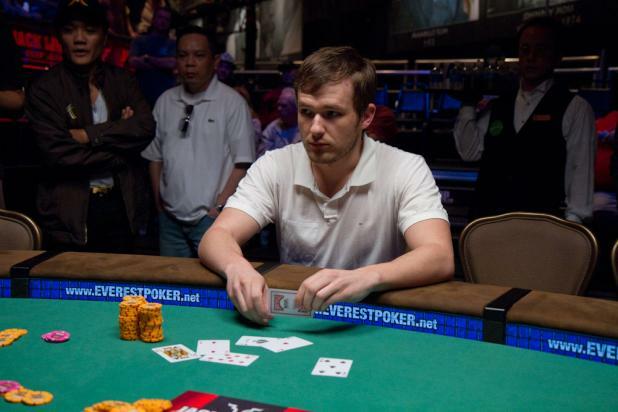 Then 22-year-old Gavin Griffin won a bracelet in 2004, 21-year-old Eric Froehlich won in 2005, and a younger 21-year-old named Jeff Madsen won not one, but two bracelets in 2006. 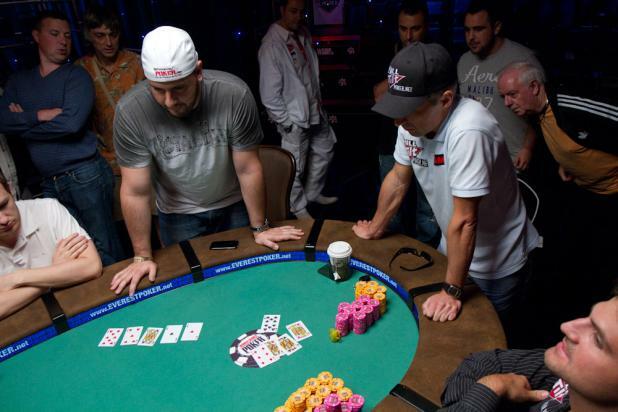 After Billirakis broke the record in 2007, he was followed by 18-year-old Annette Obrestad who won the WSOP Europe Main Event later that year. 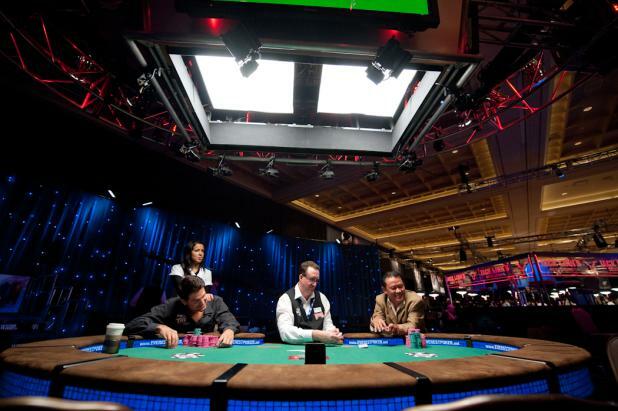 Since the WSOP Europe has a lower minimum age (18), the records are usually considered separate from each other. With seven players remaining in Event #10 ($10,000 Seven Card Stud), Brandon Adams (left) raised on seventh street showing [Kc] [2c] [Kh] [Js], and Men Nguyen tanked for a while with his [Qd] [2h] [8d] [3c]. A clock was eventually called on Nguyen, who finally called. Adams turned over K-8-3 for trip kings, and Nguyen proudly turned over [Ad][9d][2d] to win the pot with an ace-high diamond flush. 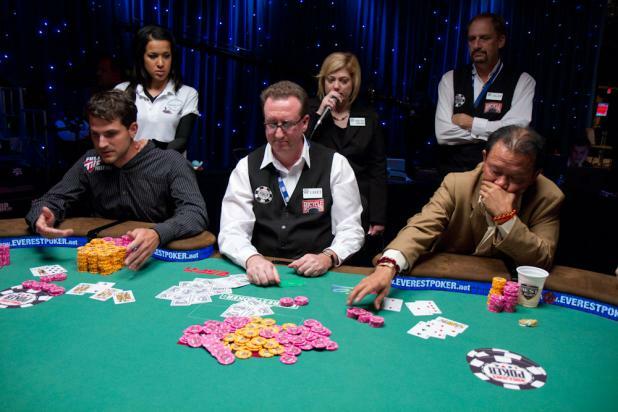 Adams was visibly annoyed, and considered it to be a slowroll when he asked Nguyen why he waited so long to call with a hand that he knew had to be the winner. At the final table of Event #10 ($10,000 Seven Card Stud), Nikolay Evdakov (left) is a WSOP money-making machine; that is, he frequently makes it to the money. He set the single-WSOP record with 10 cashes in the 2008 WSOP, and followed that up with an impressive six cashes the following year. 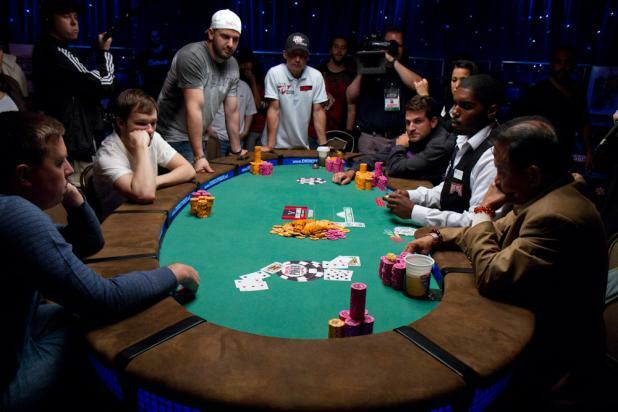 However, he has previously failed to finish deep, and this is his first WSOP final table. Brandon Adams (right) is an intellectual poker player, a published novelist with multiple Masters degrees working toward his PhD at Harvard. Both players are looking to win their first bracelet. 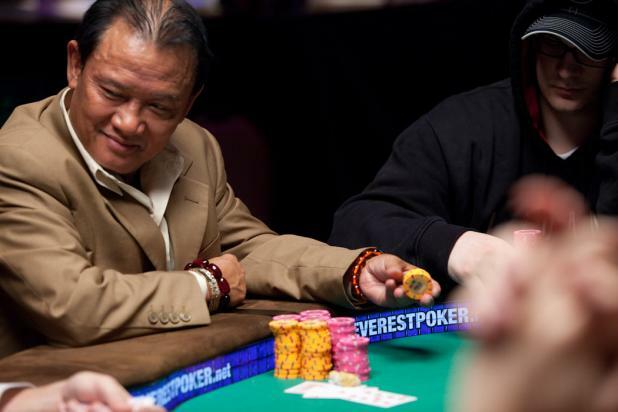 Men "The Master" Nguyen (left) has made a place for himself in the WSOP record books with six bracelets (tied for sixth) and 67 cashes (second behind Phil Hellmuth). 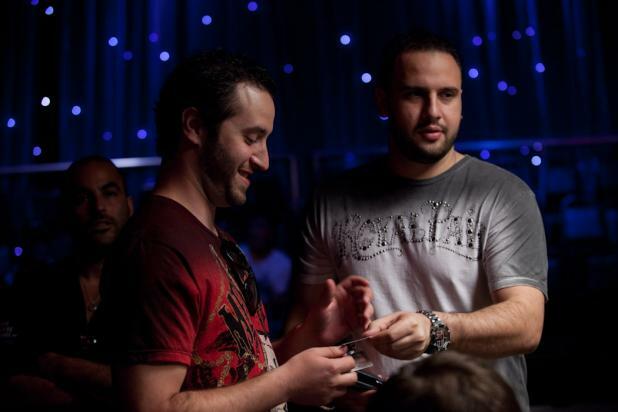 Steve Billirakis (right) may have only one bracelet, but he won it shortly after his 21st birthday and is still only 24 years old. Now that they're facing each other at the final table of Event #10 ($10,000 Seven Card Stud), the question is this: "Which will win, youth or experience?"